To do the best job possible, first sweep or vacuum your whole floor. Use a wisk broom to get into the corners if a regular broom won't work. Using a vacuum attachment regularly will also help. Combine 2 tablespoons of vinegar or ammonia in a spray bottle of water. Spray the solution int the corner. This solution is safe for most floors. 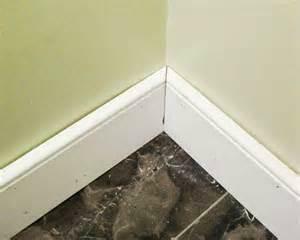 Use a soft toothbrush to get into the corner to scrub. Rinse with clear water and wipe with a dry cloth. If any dirt is still there, do the spray and scrub over.